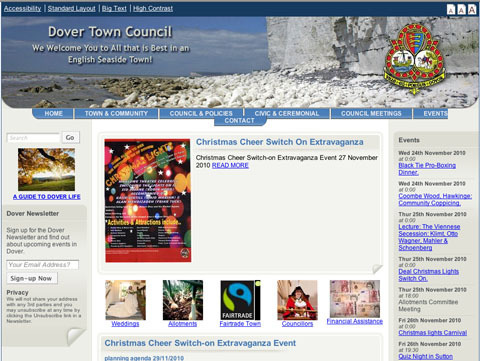 Dover Town Council has failed to remove a photograph of the 'White Cliffsu2019 from its website despite admitting yesterday that the photo actually shows a coastline 76 miles away. Dover Town Council has failed to remove a photograph of the ‘White Cliffs? from its website despite admitting yesterday that the photo actually shows a coastline 76 miles away. The error was spotted by local photographer Ray Newsam. Town clerk Mike Webb told Kent Online that web designers used the picture because it was ?hard to find a copyright-free photo taken with a professional, high-definition camera?. The photograph is reported to depict cliffs at Seven Sisters in Sussex. After admitting the mistake the council has appealed to the public for photos of the White Cliffs, for potential publication. However, they have to meet the ‘necessary standard’. The council has yet to respond to our request for comment.